The Lake Titicaca hotels listed below can be reserved online. What many visitors don't know is that the small town of Huatajata is a great place to begin exploring the lake. 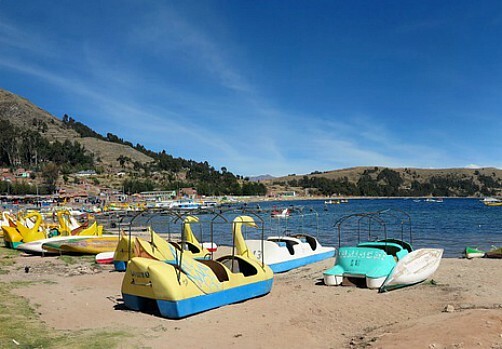 Both Huatajata and Copacabana are right on the Titicaca Lake shore. You can cross Lake Titicaca on a hydrofoil at Huatajata, a much smoother and faster way to cross over to the Island of the Sun. Hydrofoils skim the lake surface. If you’ve already found a hotel or hostel you love, or one you don't recommend, tell us in our Bolivia Hotel Review. Below is a list of hotels in Copacabana and Lake Titicaca. Check for them on Tripadvisor and Trivago. If they aren’t listed, you’ll need to book directly. Book on TripAdvisor | Book on Trivago!